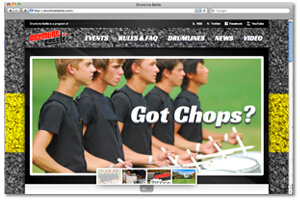 An official website for Drum Corps International's newest program offering, DrumLine Battle has been launched. Announced in January, DrumLine Battle events will provide marching percussion ensembles from across the globe with powerful opportunities to compete against each other, showcasing their talents in exciting new ways in a fun and engaging "battleground" environment. DrumLineBattle.com is a fountain of information about the DrumLine Battle program, from the latest news, participating units, schedules, rules, videos and more.